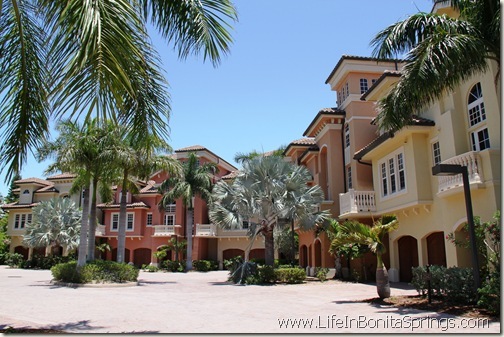 Solenzara is a gated enclave of a mere twelve, four-story attached villa homes in Bonita Springs, Florida. Solenzara is luxury community situated on Hickory Blvd. It features views of the bay and channel plus Gulf of Mexico views from the front of the residences. Homes in Solenzara are about 4,500 square feet with four bedrooms. Common features and upgrades at Solenzara include: option of gas fireplaces with granite & marble surrounds, private pool & spa, large private elevator, custom cabinetry throughout, granite counter tops throughout, wet-bar & morning bar, high-end appliances, security system, decorative wrought iron stair rails, zoned A/C, tray & coffered ceilings, 10' ceilings, impact doors & windows, concrete roof tiles, brick paver driveways & motor court, concrete construction, & a rich, Mediterranean-style look that is gated and lushly landscaped. Solenzara offers the space and feel of a single-family home with a maintenance-free lifestyle of a condo. The lawn & landscape and common area maintenance is taken care of by the homeowner association..
Villas in Solenzara are a rare design for the Bonita Beach area. The most similar style product can be found at Cape Hickory and Villas at Barefoot Beach. Solenzara also has beach access across the street. Call or text Chris today to check availability on Solenzara homes. 239-273-7430.